Photos: 3 Very Different Views Of Japanese Internment : Code Switch An exhibit at LA's Skirball Cultural Center features photos that three photographers — Dorothea Lange, Ansel Adams and Toyo Miyatake — took at the Manzanar internment camp. The agency had hoped Lange's photos would depict the process as orderly and humane. Now, some of them are on display at the Skirball Cultural Center in Los Angeles, through Feb. 21. 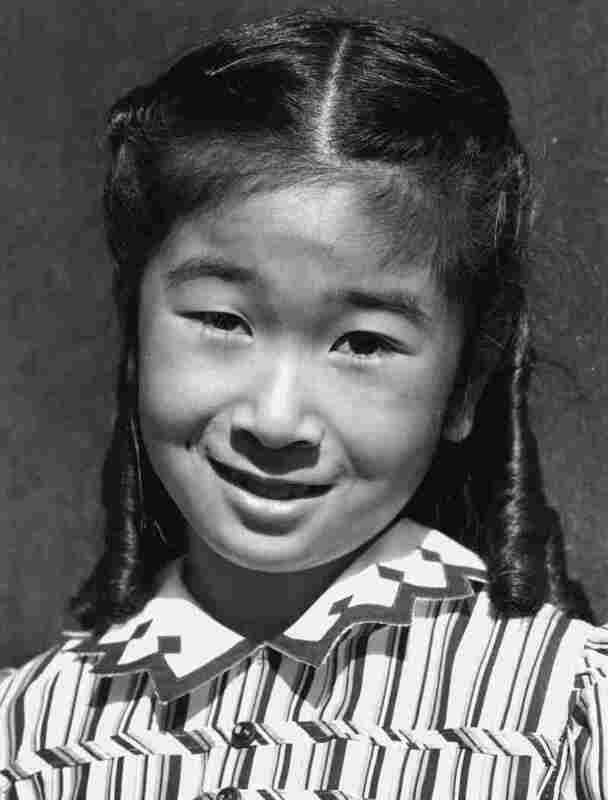 They are part of an exhibit that tells the story of Japanese internment through the pictures of three photographers: Lange; the equally renowned landscape photographer Ansel Adams, whose photos from California's Manzanar internment camp anchor the exhibit; and Toyo Miyatake, a Japanese-American photographer who was interned at Manzanar but smuggled in a camera. 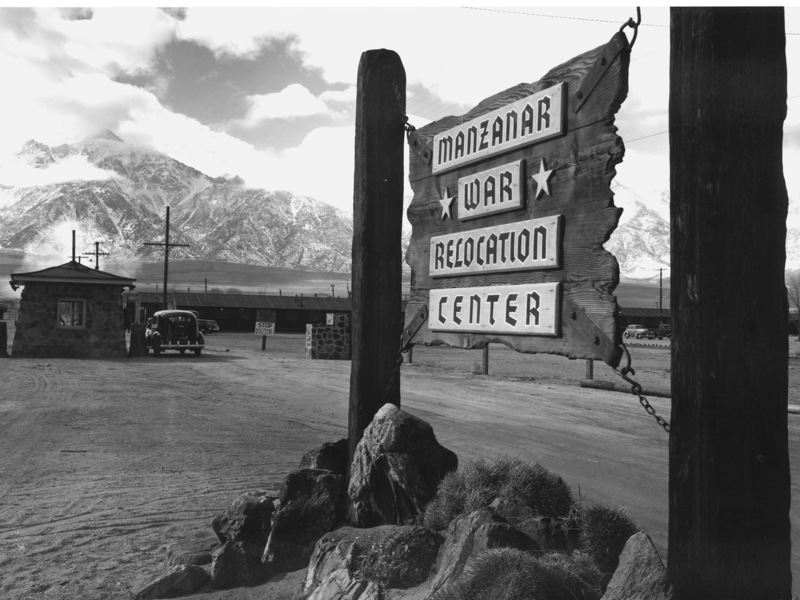 The stories that photos tell depend so much on who's snapping the shutter, and Manzanar: The Wartime Photographs of Ansel Adams illustrates that in dramatic fashion. 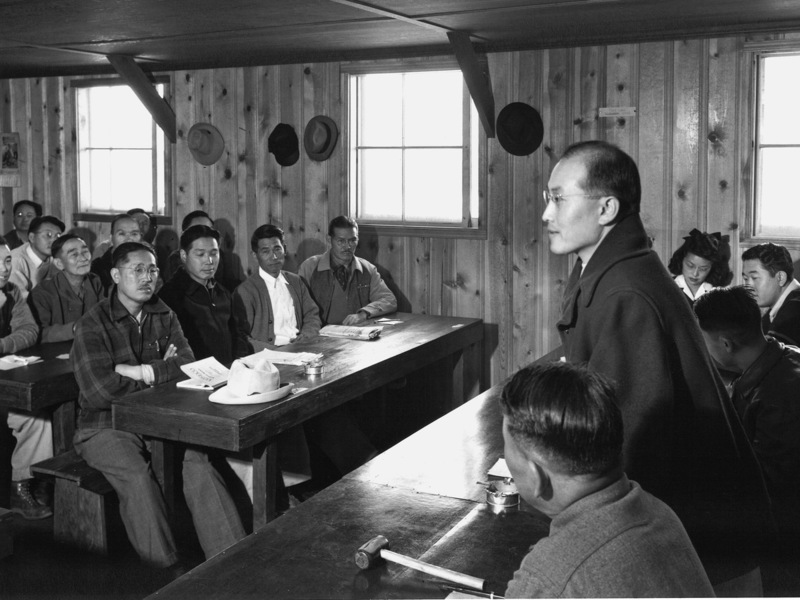 Each photographer offers a vastly different perspective on what Japanese internment was like, their photos reflecting differences not only in style, but in the relationship each photographer had to this shameful chapter of U.S. history. 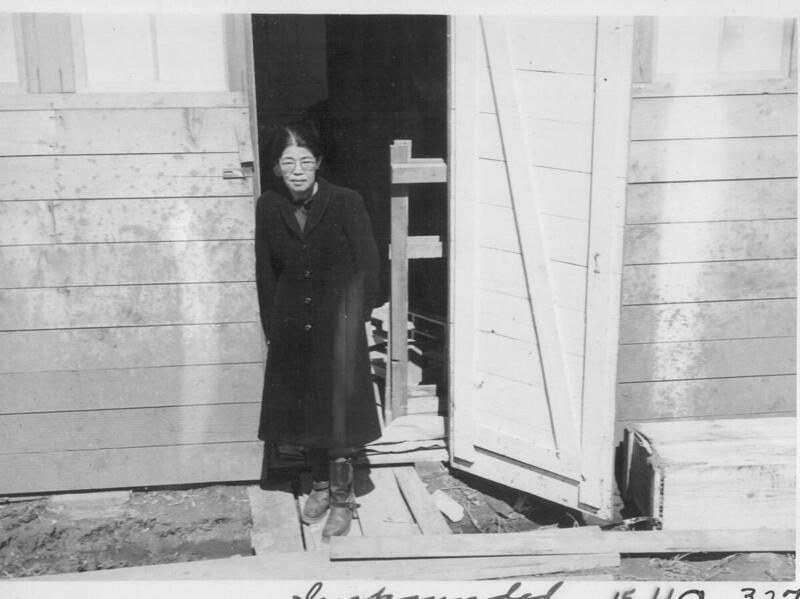 The photo below, showing a Japanese woman recently arrived at her living quarters, was among the hundreds of Lange's photos that were seized by government censors. On this original proof, the word "Impounded" is handwritten in the lower margin. 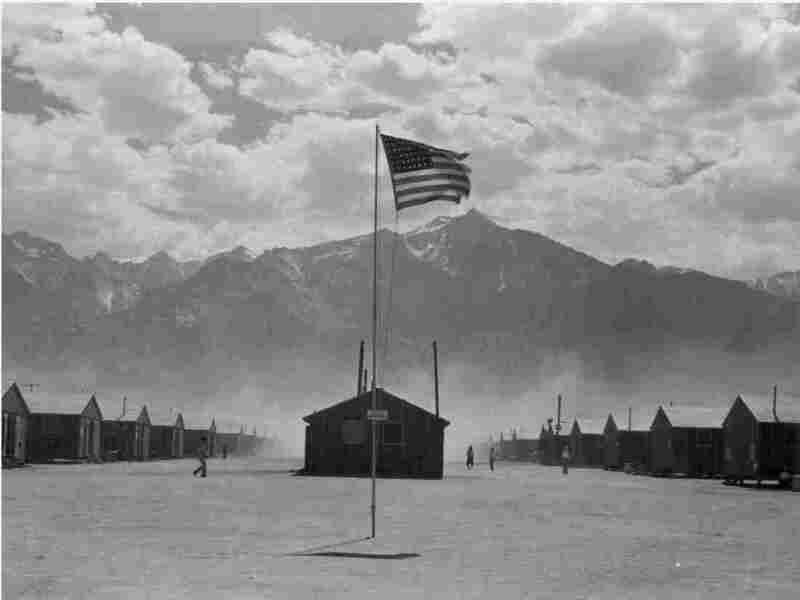 Lange's photo of the Manzanar internment camp during a dust storm highlights the camp's remote desert location. "They don't look quite as dusty and quite as forbidding as Dorothea Lange's photos," Robert Kirschner, the Skirball's director, told me as we walked through the exhibit recently. There are scenes from a baseball game, kids walking to school, a gathering outside a chapel. Lots of smiles, too, and portraits of camp residents cropped so close, you can see every blemish and stray hair. 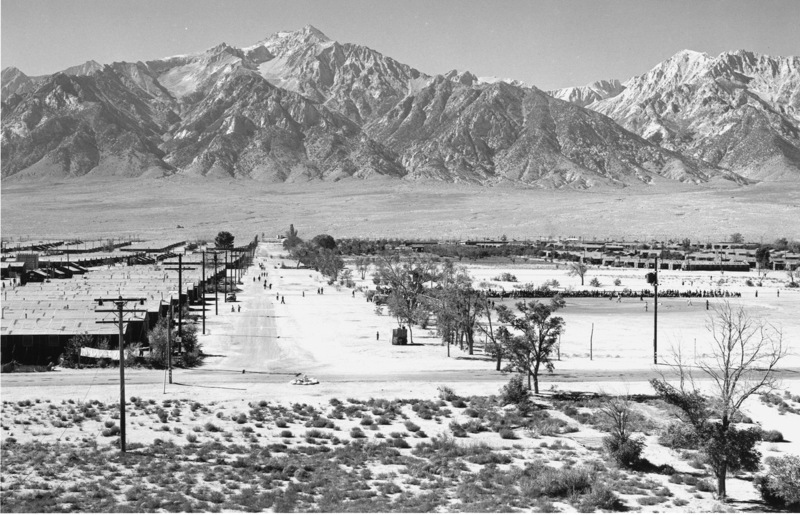 In Adams' vision, Manzanar comes off as a place where Japanese-Americans, dignified, resilient and optimistic in spite of their circumstances, built a temporary community in the desert. 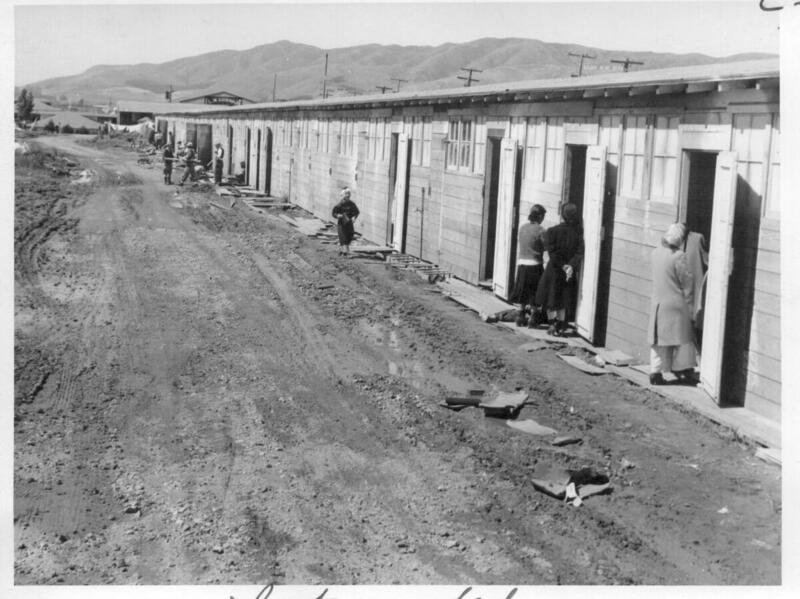 Kirschner said that if Adams' photos appear to sugarcoat the indignities of life in an internment camp, it is because he did not see himself as a social activist the way Lange did. Still, Kirscher says, Adams was challenging internment in his own way, by depicting its victims as patriotic, law-abiding Americans. 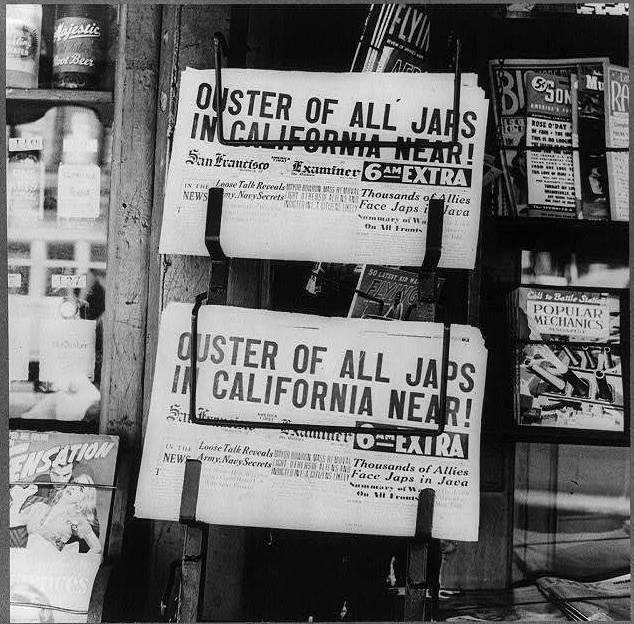 Before World War II, Miyatake had a photo studio in Los Angeles' Little Tokyo. 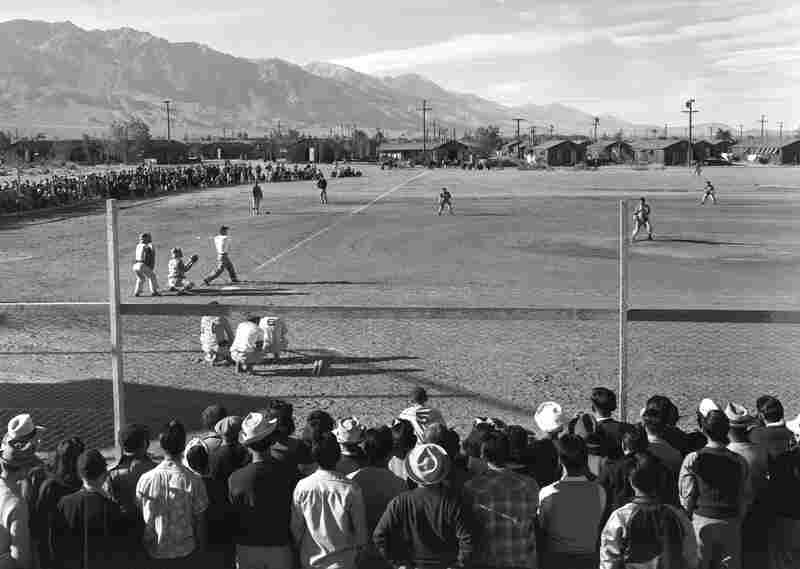 When he learned he would be interned at Manzanar, he asked a carpenter to build him a wooden box with a hole carved out at one end to accommodate a lens. He turned this box into a makeshift camera that he snuck around the camp, as his grandson Alan Miyatake explains in the video below, which is featured in the exhibit. Fearful of being discovered, Miyatake at first only took pictures at dusk or dawn, usually without people in them. 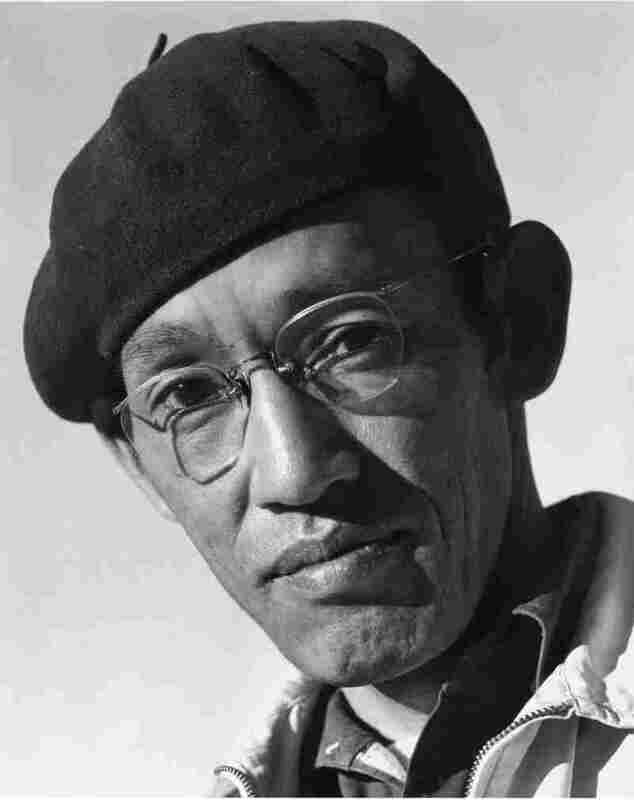 Camp director Merritt eventually caught Miyatake, but instead of punishing him, allowed him to take pictures openly. Miyatake later became the camp's official photographer. His photos also had moments of silent protest. In one picture (5:03) three boys peer through the camp's barbed wire fence to the outside world. And in another, Miyatake's son, Archie, holds a pair of clippers against the fence, "to show," Kirschner said, "that at some point, the barbed wire has to come down."